› Author AffiliationsWe gratefully acknowledge the NIH grants NS076517 and MH096463 for generous financial support. 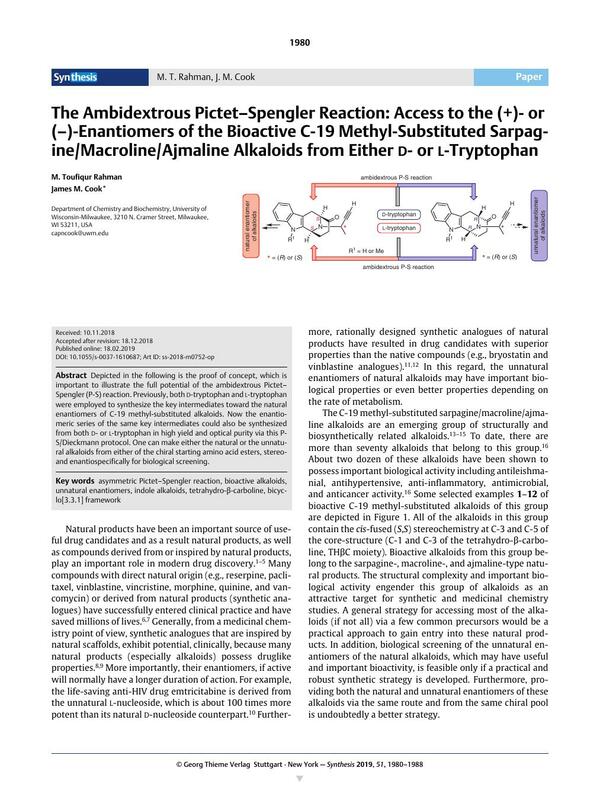 Depicted in the following is the proof of concept, which is important to illustrate the full potential of the ambidextrous Pictet–Spengler (P-S) reaction. Previously, both d-tryptophan and l-tryptophan were employed to synthesize the key intermediates toward the natural enantiomers of C-19 methyl-substituted alkaloids. Now the enantiomeric series of the same key intermediates could also be synthesized from both d- or l-tryptophan in high yield and optical purity via this P-S/Dieckmann protocol. One can make either the natural or the unnatural alkaloids from either of the chiral starting amino acid esters, stereo- and enantiospecifically for biological screening. Supporting information for this article is available online at https://doi.org/10.1055/s-0037-1610687.